A light infusion of the tops of the plant, used fresh, is excellent for all disorders of the stomach, creating an appetite, promoting digestion and preventing sickness after meals, but it is said to produce the contrary effect if made too strong. drills 6 inches apart, putting in seed half an inch deep. Plant outvseedlings a foot apart. Full sun or part shade. The plant was of some importance among the Ancient and the Mexicans, who celebrated their great festival of the Goddess of Salt by a ceremonial dance of women, who wore on their heads garlands of Wormwood. 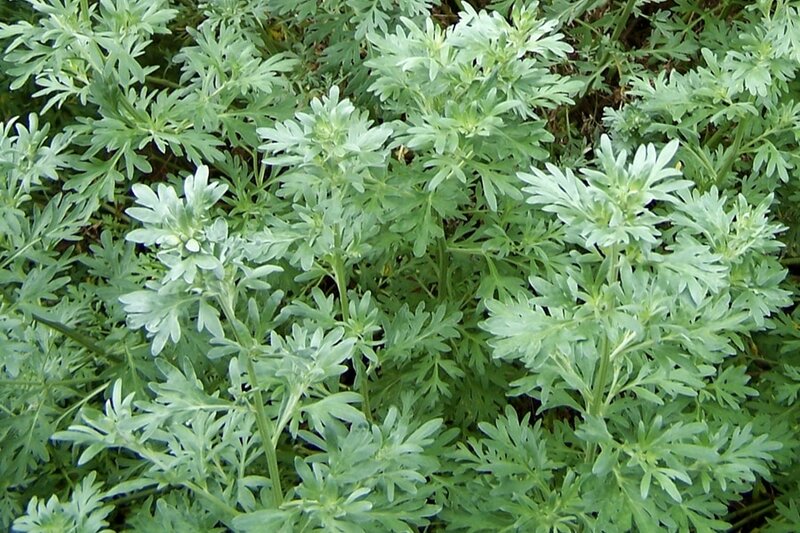 With the exception of Rue, Wormwood is the bitterest herb known, but it is very wholesome and used to be in much request by brewers for use instead of hops. 'As bitter as Wormwood' is a very Ancient proverb. The leaves resist putrefaction, and have been on that account a principal ingredient in antiseptic fomentations. ​The intensely bitter, tonic and stimulant qualities have caused Wormwood not only to be an ingredient in medicinal preparations, but also to be used in various liqueurs, of which absinthe is the chief, the basis of absinthe being absinthol, extracted from Wormwood.